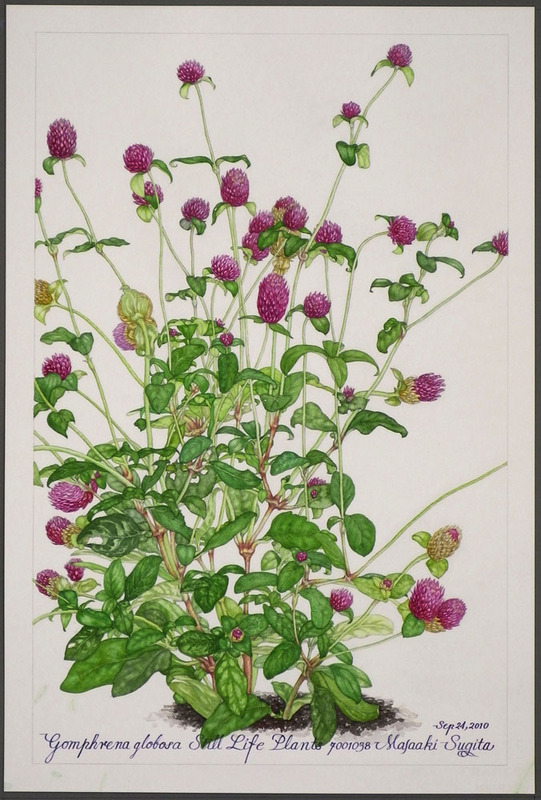 I have always had a deep love of both art and science, and it is this love that led to my Flowers and Fractals Series. 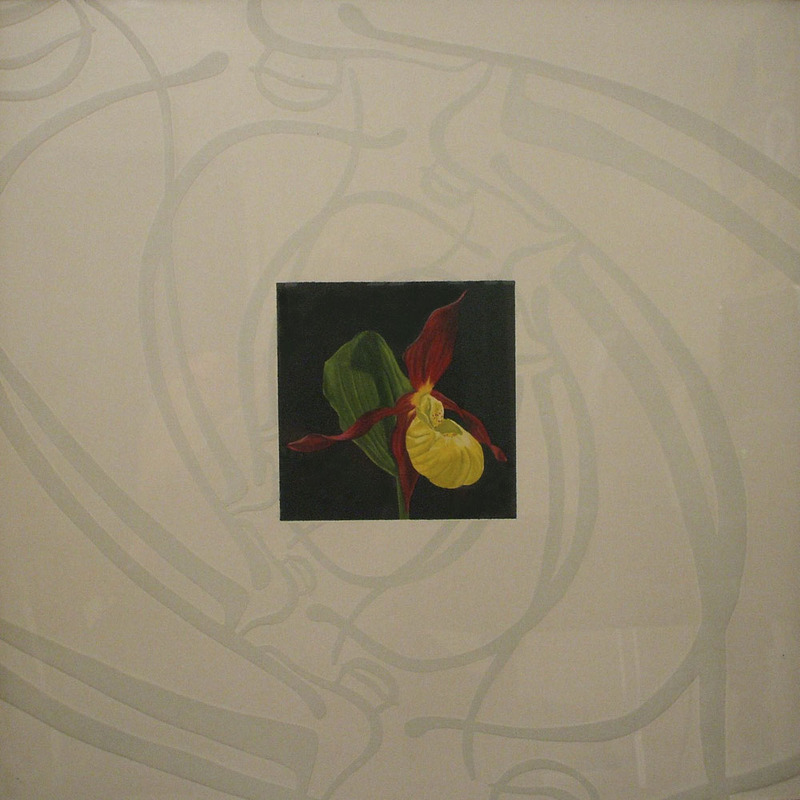 The series gave me a way to combine both interests in a beautiful way, with flowers being both a traditional subject of art and a biological specimen, and fractals, which are highly detailed patterned graphs of complex mathematical equations, examples of which also are found throughout nature. I am fascinated by the interaction between the abstracted mathematical designs on paper and their organic counterparts found in nature. “Lady’s Slipper” was created because it is my favorite of all orchids, which are some of my favorite flowers. Of all of Borneo’s varied ecosystems, perhaps none is more surprising than the biologically impoverished (by equatorial standards) dwarf forests that occur throughout the island, but more commonly in the west. The ecologist P. W. Richards called them ‘heath forests’ after the similarly infertile lands of his native England, but they’re better known by the Iban term ‘kerangas,’ which means ‘land which will not support rice cultivation.’ Kerangas soil is typically acidic, sandy, and podzolized, or heavily leached. Essential elements enter the soil from decaying leaf litter, but most of them leach away very quickly, and are available only in the top few inches. Despite the poor soil, healthy kerangas forests are dense with trees, most of them under 30 feet tall and three inches in diameter. In contrast to most equatorial forests, only a few species are represented. Orchids show the greatest species diversity among kerangas plants, and terrestrial as well as epiphytic species are usually in evidence – here, several individuals of the showy terrestrial slipper orchid Paphiopedilum javanicum grow from the soil. Many kerangas plant species bear nitrogen-fixing bacterial nodules on their roots, and carnivorous plants also thrive. Borneo’s kerangas forests are a center of diversity for pitcher plants, which trap insects in modified water-bearing leaves. At least one Bornean species secretes a nectar that attracts tree shrews whose droppings are captured in the pitcher to nourish the plant. 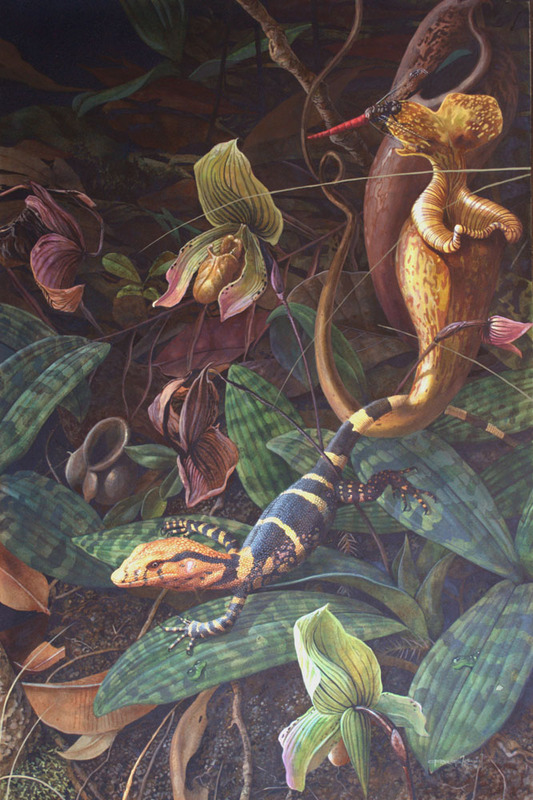 Two pitcher species appear in this painting. Included in the leaf litter are shed leaves of the dominant tree Cratoxylum glaucum and shed podocarp needles. Also included are a hatchling Duméril’s Monitor, a Red Swampdragon, the left-handed land snail Dyakia kintana, a Giant Forest Ant, and a procession of Longipeditermes longipes termites returning to their nest with balls of lichen in tow. I like the combination of the magenta and green of bachelor’s button… and the style too: a long stalk that puts the flower on the top and ‘cubic’ leaves by the midrib and vein. My basic stance on a flower is to depict it naturally as it is, without any transformation and interpretation. It is almost always same for the landscape and the others that I face, when I am drawing them as the real objects, is the instruction by the nature and it is very fun.